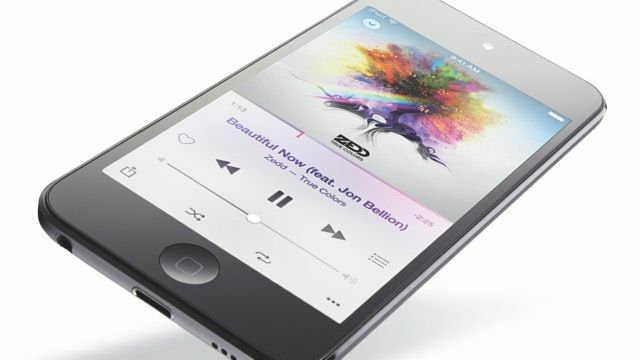 Since its launch in 2007, the iPod Touch – Apple's “iPhone without a phone” – sold over 100 million units, but then it was forced to watch from the sidelines as the flashier iPhone, iPad and Apple Watch have hogged the limelight. So in 2015 Apple decided the time was right to revitalise its brilliant pocket player with a bunch of fresh new features. This sixth-generation model - still the most current - boasts a fast, powerful A8 chip, a souped-up iSight camera and a host of new colours. As a result, its functionality and performance are similar to that of the iPhone 6, apart from the ability to make calls and track your location via GPS. You can browse the web, email, download apps, play games, stream music,take photos… but with more power and a boosted battery life, you can do everything faster and for longer. After liberating the Touch from its plastic packaging, what jumps out is its striking design and wafer-thin dimensions – it's just 6.1mm thick. It's a beautifully made device, with clutter-free, ergonomic bodywork that begs to be slid into your pocket. It's solidly built, but at a feather-light 88g you'll barely know it's there. We're expecting to see a few Black Friday iPod deals pop up this year so keep an eye on the deals box at the top of this page if you're looking to snap one up. The four-inch, 1,136 x 640-pixel Retina touchscreen is covered in a fingerprint-resistant coating – essential for when it's commandeered by the kids – and flanked by the Home button and camera lens for the improved FaceTime HD selfie camera. The aluminium back end is silky to the touch and comes in a choice of six opulent colours. Our Space Grey sample had a refined, business-like look to it, while the other options are eye-catching but not too brash. The camera in the top-left corner is slightly raised from the surface, while the ugly black blob on the other side is a necessary evil because it allows Wi-Fi signals to infiltrate the outer shell. There's a healthy selection of buttons and sockets stealthily secreted around the perimeter. Volume keys adorn the left edge, while the on/off button is housed on top in the customary spot. The bottom edge plays host to a 3.5mm headphone minijack, a Lightning connector and the built-in speaker. Fire up the Touch and you're greeted with the familiar iOS interface, with tiles arranged in rows of four across the screen. It's crisp and punchy, with effortlessly legible text and icons. As per usual, Wi-Fi strength and battery- power indicators lurk at the top, with a clock in the middle. Start rummaging around and the unit's nuclear-powered processing quickly becomes apparent. The 64-bit A8 chip makes light work of any task you throw its way – whether you're playing games like Dungeon Master 5, browsing the web, streaming high-def videos or streaming tracks from the cloud, the device does everything instantly without stuttering or slowing down. It's simply a joy to use. The A8 chip is accompanied by the M8 motion co-processor, which gives you better fitness tracking than previous Touches. Also built-in are a three-axis gyro and an accelerometer, which help you to keep track of your distances on those long cross-country runs – although we'll have to take Apple's word on that one. Of course, all this high-powered processing counts for nought if you have to charge the device up every five minutes, but thankfully battery life is hugely impressive. Apple's quoted figures are 40 hours of music playback and eight hours of video off a full charge, which sounds utterly believable – in real-world terms, we charged it up on a Friday, spent a full weekend sporadically streaming music via Bluetooth, watching videos and playing power-guzzling games, and it was Tuesday before we even thought about charging it up again. The Touch is ostensibly a music player, but that's just one of its many talents. It boasts all the usual stuff found on previous versions, such as built-in Bluetooth 4.1, Wi-Fi, AirPlay, Siri, Maps and Safari, as well as free apps like iMovie, GarageBand and Pages. When you're within range of a Wi-Fi router, the world is your oyster. Three times faster than previous versions, the web connection lets you download stuff from the App Store or take advantage of Apple Music, which is available through the Music app. It's a real pleasure to browse Apple Music's extensive library and curated playlists on this dinky device's crisp four-inch screen. Any music you've uploaded onto the hard drive or synced from iCloud is mixed in with streamable content, putting all your favourite music at your fingertips. But with no mobile-phone connection on board, you can't stream music directly while you're out and about,so you have two options – either make the tracks you want available offline, or do that rather old-fashioned thing of physically loading tracks onto the device via iTunes. The Touch is available in 16GB, 32GB, 64GB and 128GB versions. You might think that the ability to play tracks offline from Spotify or Apple Music makes on-board storage redundant, but remember that not everyone is signed up to those services. The Touch will go down well with old-school iPod devotees who still like the idea of physically storing music on their device. You can cram thousands of MP3 or AAC tracks onto the player, but disappointingly there's no support for high-res audio – we tried uploading a 96/24 ALAC file, only to be told that our efforts weren't welcome, and iTunes doesn't support FLAC. You can snap pictures while you're out and about on the upgraded 8MP iSight camera, as found on the iPhone 6. It's a fabulous camera with a fast autofocus mode that lets you set the shot quickly with minimal faffing. The results are good: photos look deep and punchy, with bold colours and scalpel-sharp detail. Even in dim conditions, the skilled Auto mode pulls out a pretty decent picture, and we had a lot of fun playing around with Apple's usual array of filters that apply classy effects to your shots. The newly added Burst mode lets you take a series of shots in quick succession. The Touch is also a dab hand at recording video, producing pristine 1080p/30fps clips with impressive depth and stability. It's the first Touch to feature a 120fps slow-mo function, backed up by a fun Time-Lapse feature. The front-mounted 1.2MP FaceTime camera isn't quite up to the same standard, delivering softer, gauzier shots and videos, but given that you'll probably only use it for selfies, it's more than adequate. It records video in 720p, and there's an improved face-recognition feature too. Gaming has always been a big part of the Touch's appeal, and yet again it's a very enjoyable experience. Not only does the A8 chip offer smooth, judder-free scrolling, but games also look stunning on the four-inch screen. It may be small but it's wonderfully sharp and vibrant, enabling every last scrap of detail and colour to shine. Sound quality is perfectly enjoyable, though the supplied Apple EarPods are uncomfortable to wear and sound tinny, so we recommend getting some decent cans. The built-in speaker is disappointing, though. We weren't expecting audiophile sonics through five tiny pinholes, but the sound is harsh, shrill and feeble. In today's smartphone-dominated portables market, one thing's for sure – if you do hanker after an MP3 player, the impressive new iPod Touch makes your choice a no-brainer. It's stylish, solidly built and a dream to use, thanks to the A8 chip and sharp screen. The features and spec make it one of the best portable players money can buy.